Looking to get your kids outside and immersed in nature this summer? Does your daughter want to learn more about animals? Is your son wanting to know about early farm life? All these activities are available in the Des Moines area and the guide below will help you narrow your choices for outdoor and nature oriented summer camps. In addition to these camps, dsm4kids has a Summer Camp Guide to help you plan the perfect camp experience for your kids. Day camps are available at ARL Main during the summer. Campers engage in interactive animal-themed experiences. Watch their website for summer 2019 info. and how to register. The Blank Park Zoo offers a number of camps throughout the summer for kids ages three to sixth grade. The zoo’s weekly Safari Camps are a great way to experience animals and all the Zoo has to offer including science experiments, crafts, and so much more. Kids in seventh grade can attend a Junior Zookeeper or Animal Careers camp. Pre-registration is required for all classes and must be received at least seven days before class starts. Chasing Laurels offers summer day camps throughout the summer months. Each camp is five days of fun on and off the horses! Camp Includes: daily riding time and horsemanship guidance, demonstrations by a vet and a farrier, sessions on the care and nutrition of horses, horse related games and crafts and much more. No riding experience necessary, Camp is Monday- Friday from 9:00 am to 5:00 pm (before and after care can be arranged). JPEC offers a number of Equestrian Camps throughout the summer. Equestrian camps are a wonderful way for a child to discover the world of horses. Classes are offered for beginner to intermediate riders. They also offer overnight camp. Kids as young as five can participate in their Tiny Tots programs. All other classes are for campers eight and up. Watch their Facebook Page and their website for 2019 summer camp info. Valley Park offers full day horse camps during the summer. Their day camps offer a wide range of equestrian activities throughout the day including daily lessons on horseback, horsemanship, barn chores and other fun activities. Horse camp is open to campers ages 6-14. Camp is geared toward the beginner and intermediate rider. No riding experience required. Camps run from 9:00 am until 2:30 pm. Brenton Arboretum offers a wide variety of youth and family classes and expeditions. Their programs have a focus on wildlife and nature. Experience the great outdoors during a stream hike, observing pond life or taking a closer look at bugs and insects. Classes are offered throughout the summer and children of all ages are welcome. Botanical Garden camps allow children to explore the natural world through the lens of their favorite activities. Using the gardens as unique classrooms, children are inspired to create and explore with hands-on activities. Guest speakers from a wide range of expertise will participate. Camps run from 9:00 am to 3:00 pm and are offered June 24th through August 9th, 2019. The Iowa DNR offers overnight summer camps for 12 to 15-year-old girls through its Outdoor Journey for Girls. Campers get hands-on experiences including canoeing, water safety, camping, survival, hunter education and fishing. Held annually in June, July and August. LHF’s outdoor day camp setting provides a fun and unique way for children entering kindergarten through 12th grade to experience day-to-day farm and town life from the years 1700 through 1900. History will come to life as campers fill their days with outdoor, hands-on activities, games, crafts and visits to Living History Farms’ historic sites. Polk County Conservation offers a variety of summer camps for youth. Summer day camps are designed to encourage hands-on learning through outdoor explorations, activities, games, crafts, and more. Camps will be led by naturalists. Camps are for kids ages 6+ and run June 25th through July 31st, 2019. On-line Registration opens March 2, 2019 at 8:00 am. Wildlife Camps is a day camp for students entering 3rd-7th grade. The registration deadline is two weeks before the camp starts. Camp goals are to: awaken an awareness of the natural world and wildlife in our state parks; nurture an appreciation for wildlife and natural ecosystems and inspire action by developing a “land ethic”. Camps offered near Des Moines include: Walnut Woods in West Des Moines, Ledges in Boone and Big Creek in Polk City. Visit the website for all 2019 dates and locations. 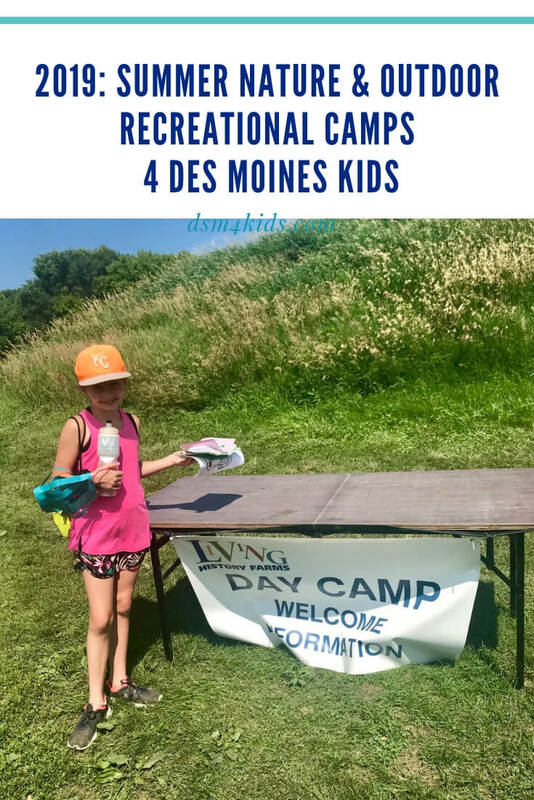 West Des Moines Parks and Recreation offers camps and classes to give children opportunities to learn about Iowa’s natural resources, environment and outdoor recreation. Offered throughout the summer to kids ages three and up Nature Friends, Nature Explorers, Camp Fish, Water Adventure Camp, Archery Classes and Explorers teach them about native insects and animals. Warren County Conservation Board Naturalists provide quality outdoor recreation, conservation and environmental education programs throughout the year. They also offer Summer Nature Day Camps that allow children to explore and enjoy nature up close. The camps are a week-long and are for four to 15 year olds. Parents may register children for camp beginning Tuesday, March 5, 2019 at 8:00 am. You can register at the Annett Nature Center or call (515) 961-6169. Space is limited. Do your little outdoor enthusiasts have a favorite summer camp in Des Moines? Tell us about it in the comments.